01 Dec 2013 What is the right roughness measure for me? If you look at two roughened surfaces it is often obvious that they are very different. Yet if you measure their roughness with a standard stylus tool which provides an answer such as Ra or Rz you find that they are “identical”. Clearly the human eye is picking up some information that your stylus probe is missing. What is that difference? The answer is that there is no simple answer to that question. More sophisticated stylus probes can provide more numbers, Rt, Rq, Rpm etc. If you are lucky you will find that one of these numbers gives a clear distinction between your two surfaces. But it would be much better if you could work out in advance which number (or more often combination of numbers) can distinguish “good” from “bad” surfaces. That’s what the Surface Profile Explorer helps you to do. You select different types of surfaces and get to see quickly how different parameters relate to different types of surfaces. For example if you go from this “High” surface to the “Deep” one you find that many of the usual numbers such as Rz or Ra don’t change, even though the surfaces are obviously different. By looking at what numbers do change you can start to build an intuition of which numbers will capture the sort of information that is important to your surface. What is often missing can be shown by comparing “High Frequency” with “Low Frequency”. They can have the same Rz, Ra and, well, Ranything. The R values tell you only about peaks and troughs, they don’t tell you about how rapidly they are changing. It is values such as λa or Pc or Sm (wavelength, peak count, spacing) which give you key information on how things change along the sample rather than in the vertical direction. When it comes to how surfaces look to the human eye it turns out that you need the right combination of, say, Rq and λa to get the perfect surface. Who should use SPE? It is especially useful in customer/supplier discussions. Getting the right surface requires commitment from both sides because until both sides agree on the values that have to be specified and measured, an intelligent dialogue is impossible. One more word of advice. 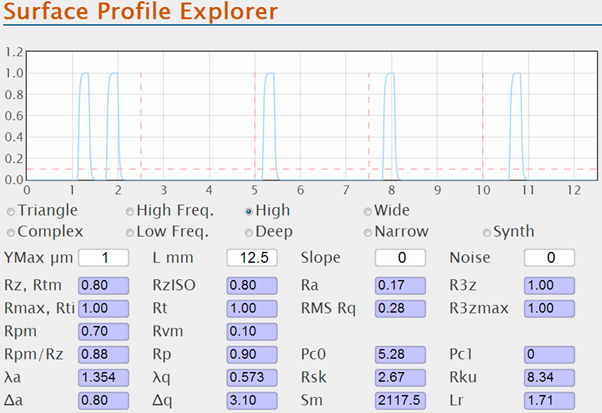 Never use a surface profile tool that doesn’t give you a digital output that you can then examine. Or, to put it another way, makers of surface profile tools should make it easy for their customers to choose a cost-effective package of hardware and software so that all their users can examine the data intelligently. A glance at the digital output can quickly alert you to some odd feature that may be crucial for success or an artefact of a bad measurement. With SPE, a digital output and a bit of experience you will find that specifying surfaces shifts from being an art to a science. In Nov 2017 I was contacted by Prof Ing Michele Ciavarella of Politecnico di Bari to point out some special cases where roughness does increase adhesion and which had been explained by extra surface area. Prof Ciavarella shows that the roughness explanation is wrong. His paper is available as: M. Ciavarella, A note on the possibility of roughness enhancement of adhesion in Persson's theory, International Journal of Mechanical Sciences 121 (2017) 119–122.